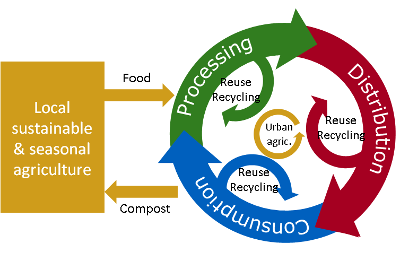 How can the various national and regional platforms on circular economy cooperate? How can mutual learning be enhanced? What is the best way of exchanging good practices? Are there any ideas for coordinated projects and initiatives? This new meeting of the Circular Europe Network focused on public strategies about food and circular economy. It presented an opportunity to discuss how the various national and regional platforms on circular economy can cooperate. It included a workshop enabling the participants to co-construct guidelines on sustainable food strategies within a circular economy perspective. The objective? To help cities and regions plan efficient strategies covering the various chains of the food loop: production (including ecological and urban agriculture, auto-production, etc. ), transformation and distribution (including product labelling and packaging policy, reprocessing and redistribution, etc. ), and consumption (including balanced diets, menu planning and food storing, composting and bio-waste management, etc.). Right after the meeting, on 16 and 17 March, the international conference “Now, the circular economy” took place in Seville, organised by the Circular Economy Foundation and ACR+.